Featuring Super Slim Taper Shafts and Cuetec's exclusive Tru-Glide Finish. Constructed of highest quality materials with beautiful designs to suit any style. Our natural series provides designs appreciated by more traditional players. These versatile cues allow the player to effectively use these for any shot on the table. Cuetec's line of Jump Cues are considered by many to be the best in the industry. They should be part of every tournament player's equipment. 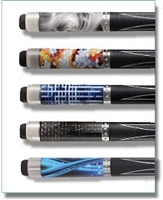 Cuetec's line of Graphite and Jump and Break Cues are considered by many to be the best in the industry. They should be part of every tournament player's equipment. The fore-shaft is made of the finest hand selected Canadian Maple then dried and seasoned under vacuum conditions insuring an extremely straight high performance shaft.